Hogan? hes been meh Glimore? All Pro, still soft, and didnt really want to resign here soooo Ragland? hes a guy, not much else Watkins? hes an overpaid guy, still with foot issues. watch him be nonexistent in this game. dont miss any of them. diff teams, diff schemes. Besides mbe Gilmore have any of those guys become gamechangers? if hes gonna be a $200 mil guy then they better win it all this year, wont be any cap room left for the rest of the team. Pats doin what they always do. No trickery, no magic, just the same crap they always do. might root for the Pats to win the SB this year, makes me ill to type that, i believe if they win Brady and Belichick will walk off into the sunset together arm and arm and the Pats will go back to being a crap organization with McDaniels as coach. 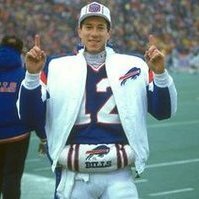 as an Ohio St. fan nothing Gary did made me go, Wow, id love for him to be a Bill. rather use this offseason to build a dominant offensive line. sure DT is a hole, O-line is more important right now imo. so Gase, with Greg Williams as D cord. should be an interesting season for Jest fans. i get the feeling that Greg will be secretly working against Gase the entire time.